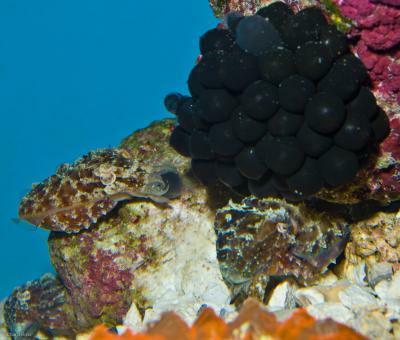 ScienceDaily (Nov. 12, 2009) — Anchored to an algae-covered rock in a 120-gallon tank at the California Academy of Sciences’ Steinhart Aquarium, a cluster of inky-colored cuttlefish eggs is beginning to swell — evidence of success for the Academy’s new captive breeding program for dwarf cuttlefish, Sepia bandensis. The program, pioneered by Academy biologist Richard Ross, is the first of its kind in a U.S. aquarium, and offers the Academy and other institutions the opportunity to study and display a species that is both captivating and — at 2-4 inches in length — less resource-intensive to keep than its larger relatives. While called “cuttlefish,” these animals are actually not fish at all — they are members of the class Cephalopoda, which also includes octopus, squid, and the chambered nautilus. Perhaps best known for their highly developed brains, nervous systems, and eyes, cephalopods are a fascinating group of animals to both researchers and aquarium visitors. For scientists, cephalopods’ advanced capabilities pose a host of unanswered questions about the nature of intelligence in invertebrates and vertebrates. For everyday observers, the dwarf cuttlefish is a captivating ambassador to its Cephalopoda class, and its native Indo-Pacific region. Able to rapidly change its skin color, Sepia bandensis frequently flashes moving patterns across its skin, and can quickly blend into its surroundings — phenomena that can be seen regularly in the Steinhart Aquarium display. Beneath that ever-changing skin, the dwarf cuttlefish’s physiology is equally remarkable, with three hearts, and an esophagus that passes through its brain. Behind the scenes at the Academy, hundreds of tiny hatchlings — exact replicas of their adult counterparts — are being hand-fed at least twice a day. In developing the breeding program, one of the most significant challenges Ross faced was identifying a successful feeding strategy for young hatchlings in the absence of existing literature. The key, he has discovered, is that young cuttlefish require live meals beginning with mysis shrimp, and increasing in size with age. Hunting with a pair of feeding tentacles, dwarf cuttlefish can devour prey the length of their own bodies. As the eggs on display at the Academy continue to expand, they transition from an inky purple to translucent, at which point the babies can be seen swimming inside their egg casings. To date, more than 350 dwarf cuttlefish have hatched at the Academy, most of which have been sent to other aquariums and research institutions. Since North American waters do not house any native cuttlefish, only a handful of species are currently seen in zoos and aquariums in the United States. Now that these small animals are available from a sustainable captive source, Academy biologists hope that other zoos and aquariums will take advantage of the opportunity to share these intriguing animals with their visitors as well. This new captive breeding program joins several others that the Academy participates in, including those for African penguins, and golden mantella frogs, all of which are aimed at protecting populations in the wild.